Amazon Web Services is the industry leader in cloud technology for a reason: they torrentially innovate. Uturn Data Solutions will help you tap into the AWS Cloud to supercharge your business. 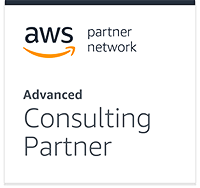 As an Advanced AWS Consulting Partner, Uturn’s staff of certified architects and developers work with these technologies every day. We bring knowledge and experience from years of implementing AWS across many industries. We know how to make these services work for you. Whether just starting to evaluate cloud technology, or already on the path to implementing a cloud-first approach, Uturn is your partner with AWS Cloud. Cloud Adoption is a general term describing every organization’s unique journey to the cloud. Whether you are considering an all-in strategy, or an ongoing hybrid model, Uturn has the experience and frameworks to help you reach your cloud goals. A Well-Architected Review evaluates your AWS environment and provides you with prescriptive advice on how to build and operate cloud optimized workloads according to AWS best practices. As an approved AWS Well-Architected Program partner, Uturn is authorized to perform Well Architected Reviews and offer AWS Usage Credits to offset the cost of 3 days of remediation services. Is your organization constrained by the rigidness, cost and complexity of your existing relational data warehouse? Are your queries taking too long? Are you tired of waiting weeks or longer to make changes to your data warehouse environment? Amazon Redshift solves these challenges and lets you to deliver agile business intelligence solutions to your users. As the FIRST Amazon Redshift Service Delivery partner in the US Midwest, Uturn has the advanced capabilities and experience to help you quickly and cost effectively evaluate moving your data warehouse to the Cloud. Ask Uturn about our Amazon Redshift Pilot program. Launch your data warehouse in the AWS Cloud. Our Amazon Redshift Pilot engagement accelerates Redshift adoption. AWS Lambda allows you to run code without having to worry about infrastructure. Pay for only the compute resources you consume. Tired of patching and updating servers that rarely gets used, serve one function and are costly to maintain? Is your application architecture dependent on polling, becoming more and more difficult to scale and maintain? With AWS Lambda, you don’t need to think about thread management. Leveraging an event-driven push architecture allows you to reimagine your application architecture. Uturn earned the AWS Lambda Service Delivery distinction by demonstrating our expertise in real customer environments. The Uturn Data Engine is a flexible, scalable data processing platform that quickly connects you to the value contained within your data. Using event-driven, server-less design patterns, the Uturn Data Engine is the best way to connect your business to the most powerful data capabilities in the AWS Cloud. Born in AWS Cloud, the Uturn Data Engine is engineered to adapt to your ever-changing business needs, now and into the future. Data Value only exists when data leads to more revenue, fewer costs, or better risk management. Data Leadership is how you maximize data value, and Uturn will help you get there. Creating Data Value is our mission. The DLF is the result of decades of experience balancing the many disciplines of data management to create the most business impact. While technology advancements continue driving incredible possibilities, the folks inside our organizations are struggling to maximize what they already have today. The Uturn Data Leadership Framework helps organizations achieve the most data value possible. Activities in each of these categories create potential data value, and the balanced combination of all five categories leads to realized data value. Each category is comprised of several complementary data management disciplines where activities take place. One of the greatest challenges of trying to create data value without the Data Leadership Framework is that data challenges like “people don’t trust our data” are vague, and can be difficult to break down into actionable pieces. The DLF gives you a path to actions that can solve any of your data needs.